Take Savska Cesta and follow signs to the A1 motorway. Take the Cvor Bjelolasica exit and proceed to the junction with route 42. Turn left at route 42 and follow to Plitvice Lakes. Driving time is about 2 hours. Take the A1 motorway north to the Koprivnica exit. 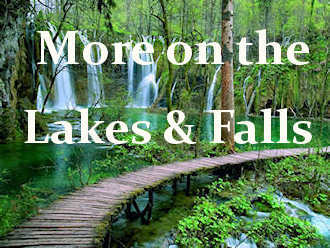 Then, continue on route 1 north to Plitvice Lakes. Driving time is about 2 hours. There are several routes from Istria, none of them particularly straightforward. The fastest is to get on the E751 heading north towards Karlovac. Then exit at Bosiljevo and head south on the E71 following signs for Split, Ogulin. Take exit 7 and take the D42. Driving time from Rovinj is about 3 hours, less from Opatija.